Pour the Chex™ granola mix into a food processor and process until you achieve a fine crumb. Transfer to a large bowl and drizzle melted butter over the top. Sprinkle with flour. 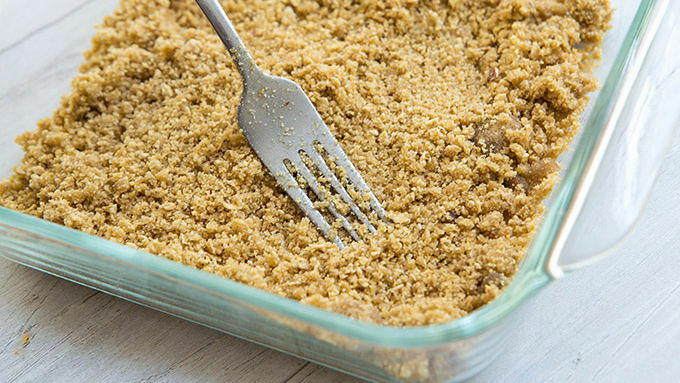 Use a fork to combine mixture into coarse crumbs. Spread half of the mixture into an 8x8-inch dish covered with parchment paper. 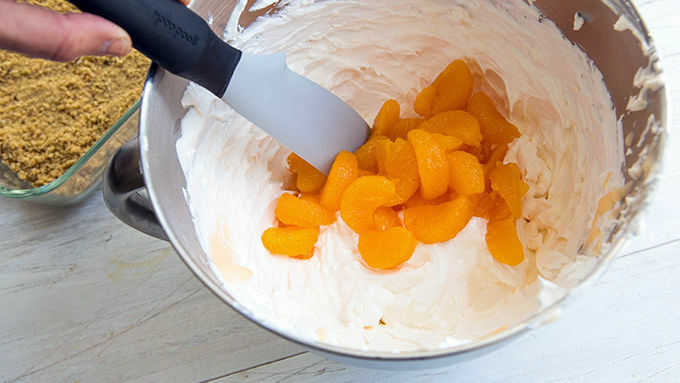 In a stand mixer, beat together cream cheese, simple syrup, whipped topping and yogurt until light and fluffy. Fold in mandarin oranges. Spread mixture over the crust. Top with remaining crumb. Cover and freeze for 3 hours or more and enjoy! When I was a kid, Grandma had a giant freezer in the back of her garage. One of those wide, industrial white ones, with a lid that lifted from the top. Whenever we’d visit her farm, while the adults settled in with lemonade on the back porch, we kids would sneak outside to see what was inside that big old freezer. There were always Creamsicles™. 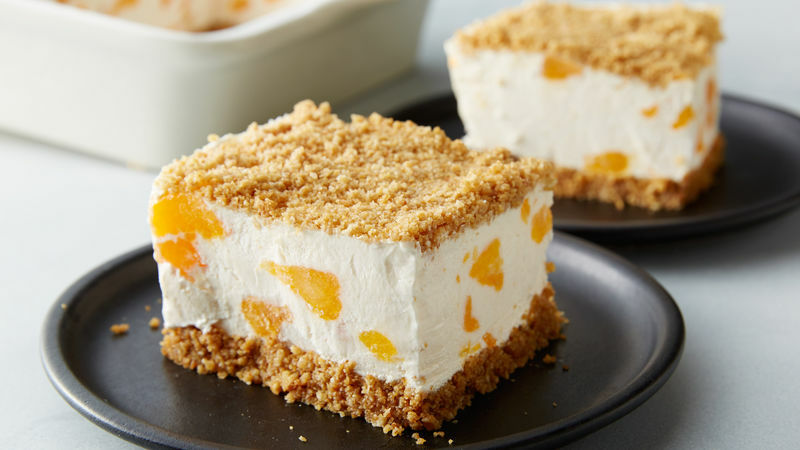 We’d peel away the paper wrapper to enjoy the sticky-sweet orange pops with a creamy layer of vanilla ice cream hidden inside. Sitting in the steaming heat of August at Grandma’s dusty farm, hidden away by the hay bales, we ate and made sweet memories, I can’t imagine a more refreshing retro flavor than classic Creamsicles™! Whether you snuck one from Grandma’s freezer, bought them from a roving ice cream man, or just love to buy boxes when they go on sale, there’s no denying the Creamsicle™ flavor combo is a total favorite. Which is why I decided to turn it into our favorite frozen crunch cake. On the heels of our famous Strawberry Crunch Cake, we decided it was high time there was a creamy orange version of this easy, freezy cake. 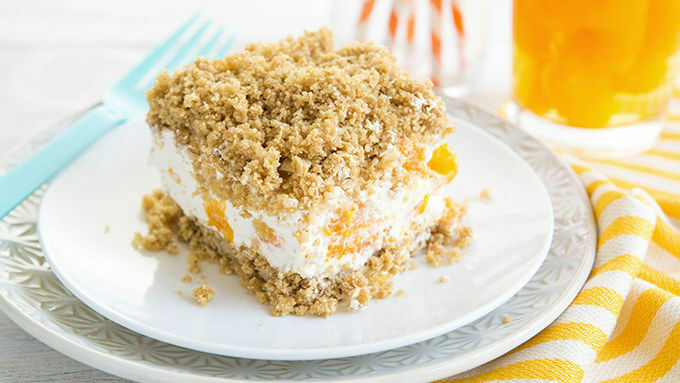 Get ready for bright mandarins, folded into a sweet whippy center spiked with Orange Crème Yoplait™ yogurt and sandwiched between two layers of streusel. OMG—prepare to feel like a kid again. No lifting the top on Grandma’s giant freezer required! Slice and serve. And grab a fork, of course. Enjoy!